If only hardtails existed, I'd golf. Hyperbole? Perhaps, but consider the statement a tip-of-the-hand to where I generally stand on the matter. Although ubiquitous at the ‘recreational’ level of mountain bikes under $1,000, for years, full-suspension machines have dominated most forms of endurance racing—outside of a sliver of the world's most elite pain-cave dwellers. Therefore, conventional justification of the ultra-efficient, high-end hardtails has been a tough sell of late. What if the intended use shifted altogether? What if the hardtail could be a viable, fun, high-end trail weapon? Kona believes it can be. The stock 780-mil-wide handlebar and 40-mil-long stem make for comfortable and capable handling at speed. 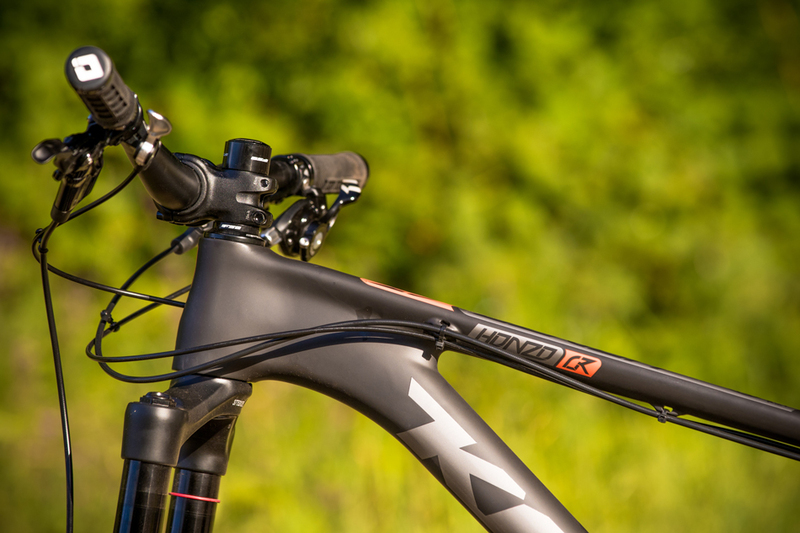 The Kona Honzo CR is the culmination of modern trail bike geometry and componentry in the form of a hardtail. Evolving from the brand’s original steel Honzo 29er, this new carbon version is available in three models ranging in price from $3,500 to $4,600, with an aluminum 27.5+ version on the horizon. I've been riding the flagship Honzo CR Trail DL for a few weeks, and its notable features begin with the eye-catching frame. 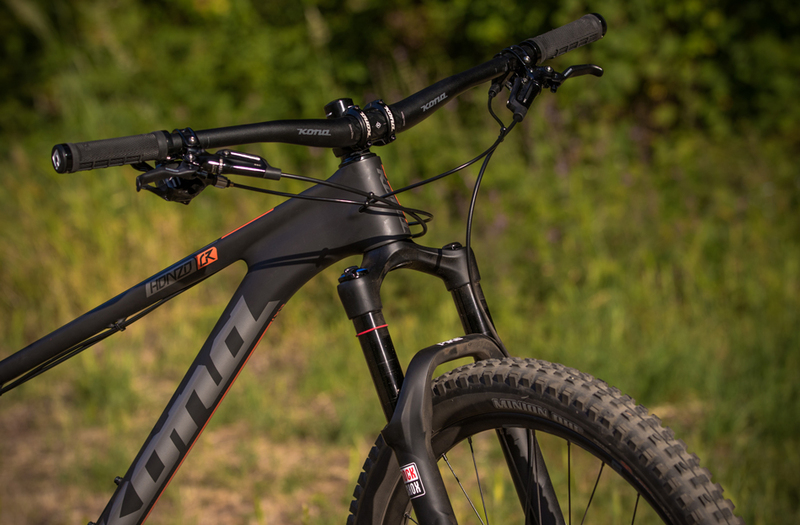 The full-carbon chassis utilizes a 68-degree head angle, über-compact 415-millimeter chainstays, internal cable routing and 148-mil rear-hub spacing to add stiffness to the rear-end. "We prioritized the stiffness and durability of the frame at the bottom bracket and headtube," explained Kona product manager Ian Schmitt. "This decision was made to maximize the performance gains of carbon and imbue the bike with what we felt was a 'Kona' ride quality." Stiffness and durability were Kona’s priority when shaping the carbon Honzo’s bottom bracket and headtube. 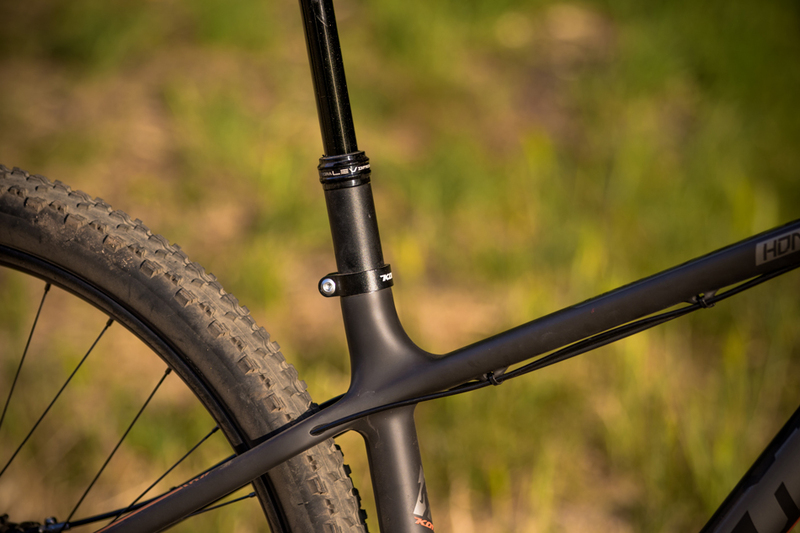 The frame's smooth lines connect the dots between the proven components, such as the 120-mil-travel RockShox Pike fork, 150-mil-drop KS Lev Integra dropper post and SRAM's Guide brakes and X01 11-speed drivetrain. The reliable build continues from the Maxxis EXO-casing tires to the cockpit, where the 780-mil-wide Kona-brand handlebar, ODI Ruffian MX lock-on grips and stubby, 40-mil-long stem illustrate the Honzo's rowdy intentions. Out of the box and without pedals, the size medium Honzo CR Trail DL weighed 25.5 pounds. Some carbon hardtails have shaped seatstays and chainstays for increased vertical compliance (flex), but not the Honzo. The frame feels firm, precise and like it's built to take a beating. The rear wheel is tucked in tightly behind the curved seat tube. 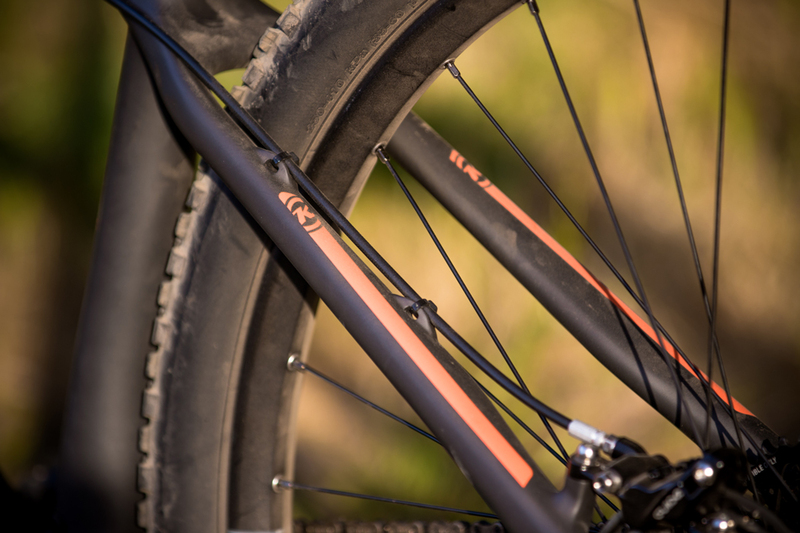 Although it doesn’t leave much mud clearance, this design helps Kona achieve its desired chainstay length for a 29-inch wheel. Additionally, the short rear end and slack seat tube angle position the wheel underneath the rider’s weight, driving the rear tire into the terrain when climbing. The result: snappy and efficient acceleration. The short rear end also makes for easy cornering and quick directional changes. "I don't even know you anymore," I said to myself while cruising down a flowy trail I know well. For a brief moment, I forgot I was on a hardtail. This speaks to how closely the Honzo's cockpit and overall front-end handling and feel resembles a full-suspension trail bike in the same travel range. Once pointed down steeper, looser and rowdier terrain I was brought back to hardtail reality, relying on the 120 millimeters of fork travel, powerful and controllable Guide brakes and aggressive Minion DHF front tire to hold my intended lines. 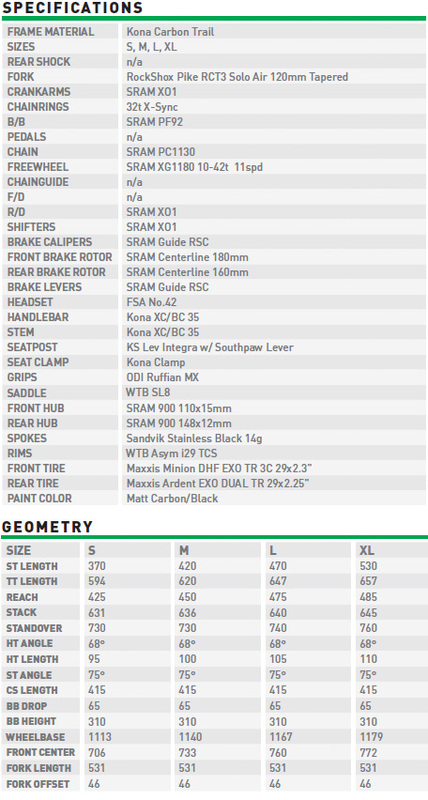 The cable-actuated, 150-mil-drop KS Lev Integra post offers nearly six inches of range in saddle height position. There's long been a misconception about the playfulness of modern 29ers. The Honzo's 12.2-inch bottom bracket height, compact rear end and wide handlebar make easy work of manuals over waterbars, or when simply lifting the front end to soak up a fast-approaching obstacle. Additionally, with a price tag of $4,600, I wouldn’t be surprised if the the Honzo CR Trail DL had the money-is-no-object gram counters in search of a versatile (and simply more fun) hardtail drooling over weight-saving potential within the Honzo's wheelset and cockpit components. In the world of endurance racing, most riders at least recognize the performance benefits of full-suspension bikes, and have largely put their hardtails out to pasture. However, when redesigned with modern spec and geometry to handle the rigors of pinned wide-open trail riding, bikes like the Honzo are re-establishing the hardtail's place in the grazing rotation. Which is pretty cool, because Pebble Beach doesn't want my kind hanging around, anyhow. "What type of rider is the Honzo for? I think a more apt question could be who isn't the Honzo for? I would suggest it isn't for anyone who is a fun hater! The Honzo has been a cult-classic staple within our product range since 2012. The cocktail of long front center, low bottom bracket, slack head angle, and short chainstays has become the de facto norm for trail bikes. At Kona, we've always had a soft spot for aggresive hardtails and truly feel that this bike is the best option for XC racers, trail riders and generally anyone who likes riding bikes." – Ian Schmitt, Product Manager, Kona Bikes.